Progesterone :The major progestational steroid that is secreted primarily by the corpus luteum and the placenta. Progesterone acts on the uterus, the mammary glands, and the brain. It is required in embryo implantation, pregnancy maintenance, and the development of mammary tissue for milk production. Progesterone, converted from pregnenolone, also serves as an intermediate in the biosynthesis of gonadal steroid hormones and adrenal corticosteroids. 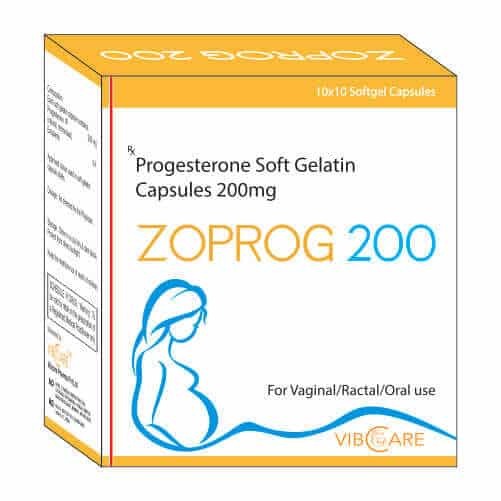 Progesterone :For progesterone supplementation or replacement as part of an Assisted Reproductive Technology (ART) treatment for infertile women with progesterone deficiency and for the treatment of secondary amenorrhea. Also used for the reduction of the incidence of endometrial hyperplasia and the attendant risk of endometrial carcinoma in postmenopausal women receiving estrogen replacement therapy, as well as treatment of abnormal uterine bleeding due to hormonal imbalance in the absence of organic pathology such as fibroids or uterine cancer.